Here is a format of Demand Notice. A link to download the Free PDF version of the format is given below. Re: Demand Notice for payment of the outstanding dues arising out of non-payment of Invoices raised against supply of materials. In the usual course of business, you, being the dealer appointed by me for the __ zone, placed orders to me from time to time for supplying materials, i.e. _________. As per your order, I supplied the said materials to you as per your said order/s and raised invoices. The goods and/or materials such supplied were received by you without any objection or demur, whatsoever. But you have defaulted in making payment against said invoices and as a result whereof a huge amount has become due and outstanding and payable to me. 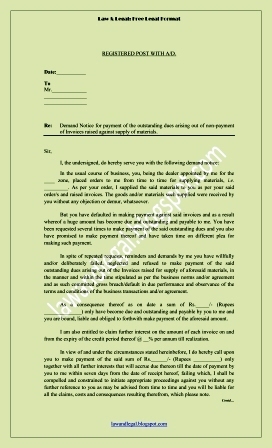 You have been requested several times to make payment of the said outstanding dues and you also have promised to make payment thereof and have taken time on different plea for making such payment. 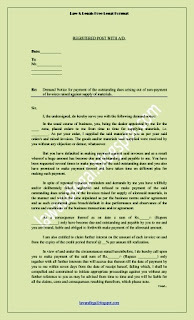 In spite of repeated requests, reminders and demands by me you have willfully and/or deliberately failed, neglected and refused to make payment of the said outstanding dues arising out of the Invoices raised for supply of aforesaid materials, in the manner and within the time stipulated as per the business norms and/or agreement and as such committed gross breach/default in due performance and observance of the terms and conditions of the business transactions and/or agreement. As a consequence thereof as on date a sum of Rs._____/- (Rupees ______________) only have become due and outstanding and payable by you to me and you are bound, liable and obliged to forthwith make payment of the aforesaid amount. I am also entitled to claim further interest on the amount of each invoice on and from the expiry of the credit period thereof @ __% per annum till realization. In view of and under the circumstances stated hereinbefore, I do hereby call upon you to make payment of the said sum of Rs.______/- (Rupees __________) only together with all further interests that will accrue due thereon till the date of payment by you to me within seven days from the date of receipt hereof, failing which, I shall be compelled and constrained to initiate appropriate proceedings against you without any further reference to you as may be advised from time to time and you will be liable for all the claims, costs and consequences resulting therefrom, which please note. However, I trust that good sense will prevail upon you and you will try to avoid the costs, complexities and hazards of litigation. If you choose to ignore this letter, you may do so at your own risk and peril. This notice is issued without prejudice to my other rights, claims and contentions in this matter.